Agricola is a Euro-style board game created by Uwe Rosenberg. It is a worker placement game with a focus on resource management. In Agricola, players are farmers that sow, plow the fields, collect wood, build stables, buy animals, expand their farms and feed their families. After 14 rounds players calculate their score based on the size and prosperity of the household. The game was published by Lookout Games and released at Spiel 2007, where it was voted second-best game shown at the convention, according to the Fairplay in-show voting. The game was released in English by Z-Man Games in July 2008. Playdek released an iOS conversion of the game in June 2013. 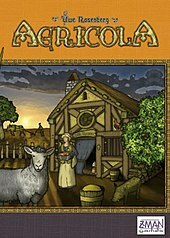 A second edition of Agricola was published by Mayfair Games in May 2016. Agricola won the Spiel des Jahres special award for "Best complex game 2008" and the 2008 Deutscher Spiele Preis. It was also the game which ended Puerto Rico's run of more than five years as the highest-rated game on the board game website BoardGameGeek, staying at the top of the rankings between September 2008 and March 2010. As of February 2019[update], Agricola is ranked 25th among all board games on BoardGameGeek. A two player version called Agricola: All Creatures Big & Small was released in 2012. There is also a corresponding iOS app. A game of Agricola being set up. Players start the game with a farming couple living in a two roomed hut. Each round, they take turns to place their family members on action spaces to get resources and improve and grow their households. Only one family member can occupy each action space within the same round, so players need to time their actions to get maximum profit while denying progress to the opponents. The game is played in 14 rounds, divided by 6 harvests. At each harvest, food is grown, people are fed, and animals multiply. Players lose victory points if they have trouble feeding their family, which makes food production a major point of tension in the game. At the end of round 14 comes the final harvest after which victory points are counted. Scoring in Agricola rewards a middle of the road strategy. Players are penalized for not focusing on any one aspect of the game, and stop scoring in any area they focus on too much. The player with the most balanced and prosperous farm wins. To achieve variation between games, players are dealt a hand of optional cards – occupations and minor improvements. Players get additional resources and various bonuses for playing these cards. They can also get an initial direction for their strategy, based on the occupations and improvements they were dealt. Numerous expansion decks have been released to fill in gaps in gameplay and add thematic settings. The game offers a simplified 'family' variation for less involved players, in which occupation and minor improvement cards are not used. The original Agricola used multicolored wooden pieces of the same circular shape to denote various resources (clay, wood, reeds, etc.). The 2016 edition offered shaped wooden pieces for resources that make it easier to differentiate between the many types of resources. The new edition also included fewer optional cards – two decks for a total of 96 cards (as opposed to three decks with 308 cards in the original edition). Some reviewers praised the balance of the new decks. ^ "Best eurogame: Agricola, Caverna, Puerto Rico or Terra Mystica?". Netivist. Retrieved October 4, 2015. ^ "Boardgame News Convention Report". Boardgamenews.com. Archived from the original on December 16, 2008. Retrieved 2009-08-06. ^ "Board Game Geek comments". Boardgamegeek.com. Retrieved 2009-08-06. ^ "Playdek's highly-anticipated agricola challenges players to build the most productive farm; plough, sow and reap victory". Gamasutra. June 13, 2013. Retrieved December 13, 2013. ^ a b c McDuffie, Tina (2016-06-04). "Agricola Revised Edition - How it compares to the original - The Glass Meeple". The Glass Meeple. Retrieved 2016-11-09. ^ Stefan Ducksch (2008-05-25). "Spiel des Jahres 2008: Best complex game 2008 (German)". Spiel des Jahres. Archived from the original on 2008-12-12. Retrieved 2009-08-06. ^ "Deutscher Spiele Preis 2008 (German)". Deutscher Spiele Preis. Archived from the original on 2009-09-01. Retrieved 2009-08-06. ^ "BGG Top 50 Statistics". Board Game Geek. Retrieved 28 July 2014. ^ "Browse Board Games | BoardGameGeek". boardgamegeek.com. Retrieved 2019-02-27. ^ "Agricola: All Creatures Big and Small". boardgamegeek.com. Retrieved 2016-12-12. ^ Temkin, Max. "Agricola". playtestblog.com. Retrieved 2015-10-05. ^ a b "Agricola – Mechanics and Tension". A Cardboard Empire. Retrieved 2015-10-05. ^ a b c Appelcline, Shannon. "Anatomy of a Revision: Caverna". Mechanics & Meeples. Retrieved 2015-10-05. ^ "Eurogames". martinfowler.com. Retrieved 2015-10-05. ^ "Agricola: Gamers' Deck | Board Game | BoardGameGeek". boardgamegeek.com. Retrieved 2015-11-20. ^ "Review: Agricola World Championship and NL Decks". GameHead. Archived from the original on 2015-11-20. Retrieved 2015-11-20. ^ "Agricola Expansion: Belgium Deck - The Gamer Nerd". The Gamer Nerd. Retrieved 2015-11-20. ^ "Review: Agricola". Retrieved 2015-10-05. ^ "Game Publisher :: Zman Games" (PDF). zmangames.com. Archived from the original (PDF) on 2010-11-30. ^ Meyer, Benjamin. "Agricola Unofficial Rule Book" (PDF). ^ "Agricola: Revised Edition Review - Let Them Get Their Own Food!!". Broken Meeple. Retrieved 2018-01-12. Wikimedia Commons has media related to Agricola (board game).